Wrap up your body and relax! Note: These body treatments are NOT suitable for pregnant women. Following a consultation with your therapist, a treatment plan will be devised according to your requirements. The allocated time and the nature of your requests/injuries will dictate the direction of the treatment to ensure the best results and optimal outcome for you. The ultimate in indulgence, allow your body and mind to become truly rejuvenated and relaxed. Full body exfoliation followed by a hot stone massage. The heat in the stones will penetrate into your muscles and the fluid motion of the massage will enable deeper relaxation for the body and mind. Finished with a scalp massage. 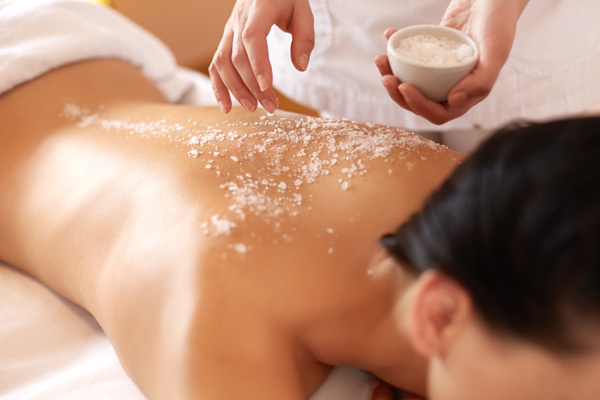 This exceptional treatment begins with a body exfoliation to prepare the skin for the rosehip oil – high in Vitamin C, antioxidants and healing powers – followed by a massage, then a wrap in warm, soothing blankets, allowing the oil to penetrate, as you enjoy a mini-facial and foot massage. Melt away with this full body lavender exfoliation, followed by an application of soothing lavender lotion. Relaxing while wrapped, you will receive a mini-facial with a scalp and foot massage, which will uplift your senses. Choose the scrub you want from our wonderful array of essential oils. Experience an invigorating full body exfoliation removed with warm, soothing towels and moisturize with body lotion. The treatment is followed by a hand and foot massage; the ultimate in relaxation! A deep, full-body treatment, which starts at the feet and progresses up to the head. It is a sequence of gentle, flowing movements, which stretches and loosens joints and muscles. This unique therapy influences the energetic side as it restores the flow of energy with applied acupressure. Enjoy a blend of Traditional Thai Yoga Massage and Reiki Healing. These two Eastern born treatments share the common benefits of enhanced body/mind connection, stress reduction, muscle relaxation, improved energy, and an increased sense of well-being.